If you’ve read the last few posts, you may have decided to make a book map of your current project, whether it’s in progress or in editing. Great! But once you’ve built a book map, what do you do with it? You use it to examine the structure of your book and see whether it shows any anomalies or holes. In an informational nonfiction book with multiple elements, the book map can be used to ensure everything is in place. I built this book map for a small group study I edited for a client. (For my clients’ privacy, I’ve removed the distinguishing information from these sample book maps.) The chapters were originally handouts the author made for her own small group. The publisher had several concerns: epigraphs, exercises, and permissions. The book map verified that the epigraphs were consistent. There are two per chapter, which is unusual, but that’s the way the author wrote it so the publisher was OK with that. The introduction and conclusion don’t have epigraphs, but the publisher decided that didn’t matter. If only one of them had an epigraph, we probably would have edited so that the introduction and conclusion matched each other, even if they didn’t match the chapters. The number of exercises per chapter was fairly consistent, but the book map did reveal an anomaly: One chapter had far more exercises than the others. After discussion, the publisher chose to leave it, but he could also have asked the author to revise. The map showed what was going on so he could make an informed decision. The book map highlighted the four elements of the book that needed permissions. The author secured reprint permissions for three of them. The fourth had to be cut and totally rewritten from our own research. One thing I was taught to check for—both in fiction and nonfiction—is chapter length. How long your chapters are may vary by your style and genre, but it’s a best practice to keep them about the same length, give or take five pages. In this case, the book map showed that one chapter was longer than average, and another was far shorter. We decided to beef up the shorter one, but the lengthy one had a topic that warranted the higher page count, so we let it go. I also used the book map to call out to the author that one of the chapter titles was a little too vague. 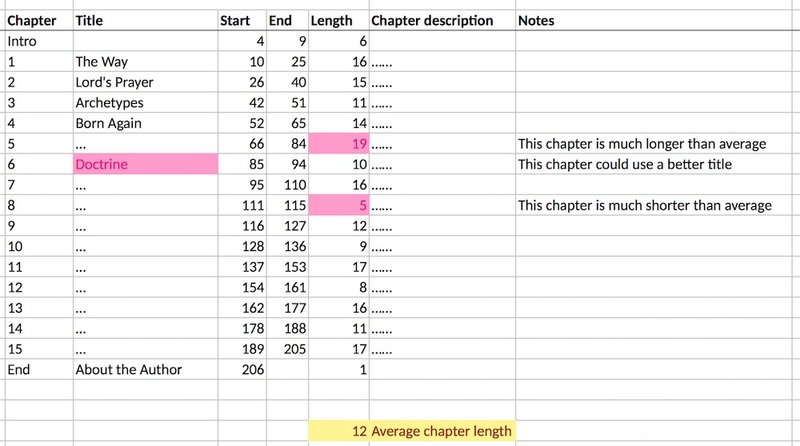 Note that I use a formula in Excel to calculate the average chapter length. I take that number and then use conditional formatting to highlight the chapters that are more than five pages greater or less than that number. Next time we’ll look at applying book maps in fiction. This entry was posted in Editing and tagged Book Mapping, Chapterizing, Edit Like A Pro, Elements of Nonfiction, Structure.